If you just won the ballot for the 2019 London Marathon or decided to start running a bit more seriously, you may want to investigate purchasing trainers that will be suitable and won’t ruin your feet or, even worse, your joints in the process. We recommend to our clients to invest in good quality and well-fitting trainers for running. When an injury occurs, it will cost you time off the road and money with therapists to get back into training, so making sure you do everything you can to prevent one is imperative. Today’s article was also lifted from one of our guides you can pick up from reception. Claire, our personal trainer, sports massage therapist and sports nutritionist has worked in a running shoe shop for years, helping people just like you find the best pair of running shoe for their feet and goals. Here is her advice so you can choose the right shoes for you. Claire is also happy to go through a running assessment with you if you need some advice before hitting the shops. In the last few years, most sports retailers have started including treadmills in their shops and may try to get you to stand barefoot on a pad that shows how you distribute pressure through your feet. Some even charge for gait analysis (unless you buy shoes from them). Here are three things to consider before entering a running shoe shop, so you will know where to start your search on the shelves. Employees will ask you these questions and it’s better to be prepared, whether you have your gait analysed on the spot or not. While the shape and strength of your arches may influence how you run, other factors are also involved in running such as other joints, footwear, and technique. Weak or collapsed arches may benefit from a little bit of support, but it may not be necessary or even comfortable when running. Very high or rigid arches may benefit from arch support to help the shoe fit snugly, preventing blisters and distributing force more evenly. A more cushioned shoe may also be helpful to absorb impact. If the shape of your foot requires an insole, the best place to go is a podiatrist who can make you one that fits the shape of your foot perfectly. Note: “support” in your running shoe is not the same thing as “arch support”. Running shoes are normally categorised by “support” level, which refers to how much of a rigid section has been built into the midsole. This more rigid section sits roughly under your arch, sometimes as far back as under your heel, and is designed to prevent your foot from rolling too far inwards. Most of us will benefit from a small amount of support, especially towards the end of a run when we fatigue. The amount of cushioning in your shoe can be a matter of individual preference, but more cushioning may be necessary for heavier runners and heel strikers. Different brands use different materials to create the cushioning – common types are gel, air bubbles, and different densities of foam – but which one you choose is purely down to personal preference. Note: usually, the more cushioned shoes are the more expensive ones! 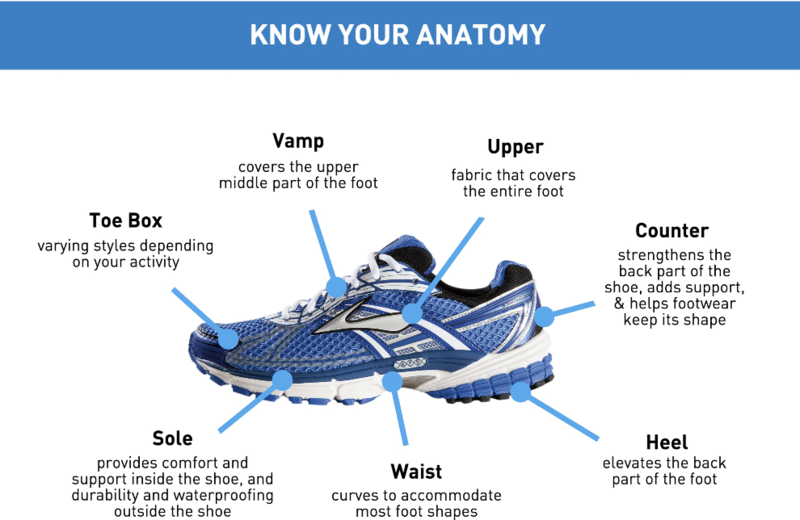 Once you have established what support level you need and how much cushioning you prefer, then you can consider the shape and fit of the shoe. Some brands are narrower than others, some have a wider toe box, and some come up higher on the ankle or Achilles tendon. It’s very normal for your running shoes to be half a size or a full size bigger than your casual shoes; you’ll want about a finger’s width of space at the end of your big toe when you are standing. 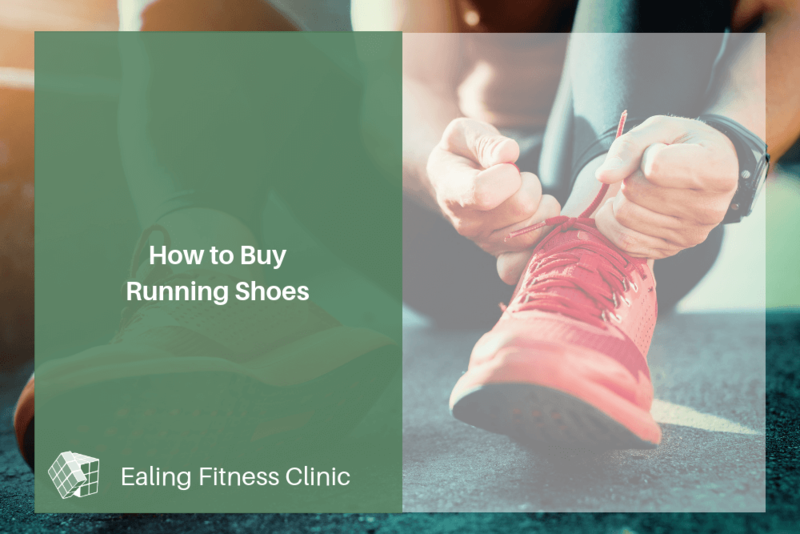 Seek out a specialist running shop where they will let you test the shoes on a treadmill – some even let you return your trainers within 30 days even if you have run outside in them. Try on several different brands, in similar “support” and “cushioning” levels. Wear good quality running socks that fit properly. Tie the laces up properly, from the bottom up, even when you are just trying shoes in the shop.